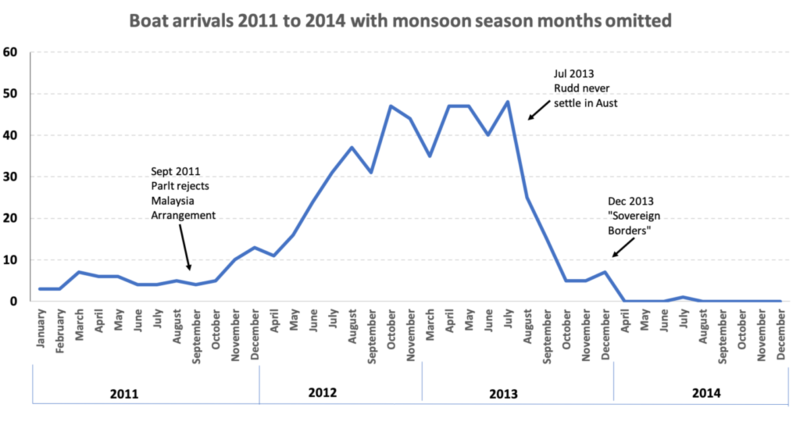 From September 2015, almost four years ago, Peter Hughes and I have pointed out repeatedly that Tony Abbott and Scott Morrison triggered the surge in boat arrivals from September 2011 and did not stop the boats as they claim from December 2013 when Operation Sovereign Borders commenced. The facts that Peter Hughes and I have set out have not been challenged. They have not been disputed in any way. But the mainstream media continues to accept Coalition spin on boats. Perhaps our mainstream media have trouble with tables. So I decided to set out the facts in graph form, below. There are two graphs on boat arrivals 2011-2014. The first graph describes the ‘raw’ data, whereas the second graph omits the monsoon months.The monsoon varies from year to year but usually runs January to March. This second graph, excluding the monsoon months is probably a better measure of boat arrivals in response to government policies. Source for Graphs: Department of Immigration and Border Protection, Submission to the Select Committee on the Recent Allegations relating to Conditions and Circumstances at the Regional Processing Centre in Nauru, May 2015. (Submission 31), Data on Attachment H, following P 87. There were three critical ‘decision months’. The first was September 2011 when the Coalition in the House of Representatives with the help of the Green MP and Independents rejected amendments to the Migration Act which would have enabled the Gillard government to implement the Malaysian Arrangement. It was necessary to amend the Migration Act in light of a High Court decision. Under the Malaysian Arrangement 800 boat arrivals would initially be repatriated to Malaysia and Australia would accept 4,000 refugees from Malaysia who had been orderly processed in Malaysia in cooperation with the UNHCR. With the collapse of the Malaysian Arrangement, when boats were arriving at 4 to 5 per month, there was a steady and then rapid increase in boat arrivals until July 2013 when 48 boats arrived. The second critical ‘decision month’ was July 2013. In that month the Rudd government announced that any people arriving by boat would never be settled in Australia. As a result, boat arrivals fell dramatically from 48 in July to 7 in December 2013 when OSB commenced. The third critical ‘decision month’ was December 2013 when, with great fanfare, Operation Sovereign Borders commenced. But when OSB commenced the job was almost done as the graphs show. Boat arrivals were by then only a trickle. Tony Abbott and Scott Morrison were involved only in cleaning up a few loose ends. The job was substantially done by the time OSB commenced. I hope that with these easy to follow graphs, our mainstream media can at last understand three things. The first is that by defeating the means to implement the Malaysian Arrangement, Tony Abbott and Scott Morrison triggered the surge in boat arrivals from September 2011 onwards. The second is that the decision by the Rudd government in July 2013 to refuse settlement in Australia for any persons arriving by boat after that date, resulted in a dramatic reduction in boat arrivals from 48 to 7. That was the game changer. Third, when OSB commenced in December 2013, boat arrivals had almost stopped. Tony Abbott and Scott Morrison did not stop the boats. What is clear is that they did not want Labor to stop the boats. The mainstream media has fallen for the Coalition’s spin on boats for almost four years. Perhaps the graphs will make it easier for journalists to understand. I am not confident. It is hard to admit that you have been conned. In response to Kevin Bain: Thank you for referencing my article. In my view it is impossible to completely untangle all the events that led to a decline in boat arrivals from mid July 2013 onward. The arguments that the rejection of the so-called Malaysia solution emboldened the smugglers, and that Rudd’s 2013 “no chance of settling” announcement and policy (which, by the way, divided parents from their children for years) helped deter boat arrival numbers are both plausible and I certainly do not dismiss or discount them. As Paddy Gourlay has noted in Inside Story, (https://insidestory.org.au/times-already-up-for-this-failed-experiment/), and as I referenced in my piece, after his announcement Rudd also “accelerated the assessment of Sri Lankan asylum seekers, quickly returning many of them home, and Indonesia slowed the arrival of people on its shores by introducing visa requirements.” I suspect these practical steps were also influential factors but they are not mentioned in the above article by John Menadue (for whom I have the greatest respect). 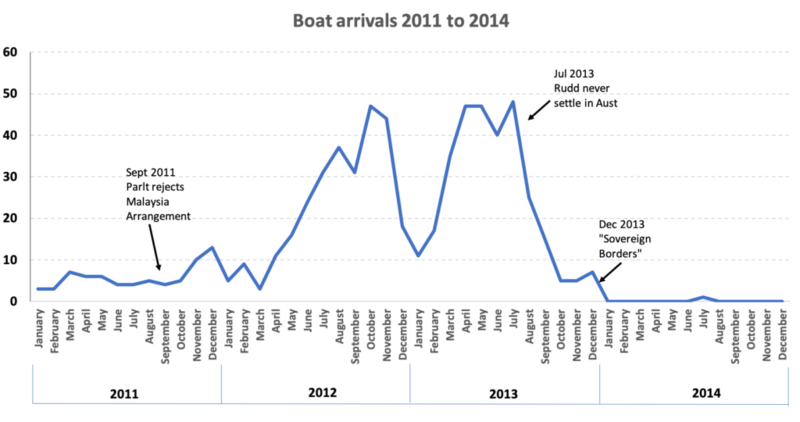 The claim in the article is that “As a result [of Rudd’s July 2013 announcement], boat arrivals fell dramatically from 48 in July to 7 in December 2013 when OSB commenced.” This direct and exclusive linking of the Rudd announcement and the drop in boat arrivals is too big a call for me. And it does not explain why boats stayed stopped, because as the data shows, between December 2013 and June 2018, 33 more boats carrying a total of 810 people attempted the journey (https://www.aph.gov.au/About_Parliament/Parliamentary_Departments/Parliamentary_Library/pubs/rp/rp1819/Quick_Guides/BoatTurnbacksSince2001). Obviously Rudd’s announcement and its subsequent continuation in words and practice by the Abbott/Turnbull/Rudd government did not deter them from setting out. Those boats were all turned back. But I am not so much concerned with debating who is right or wrong about the history. The overall argument of my Inside Story piece — and apologies if I did not express it clearly enough — is that it is continued boat turn backs, not the continued misery of 1000 odd refugees and asylum seekers on Manus and Nauru (for which,as I show, we are still shelling out more than $1 billion a year) that has the most effect if deterring new arrivals. My point — and I’m pretty sure JM and Peter Hughes would agree with me on this — is to challenge the claim that we cannot resettled those benighted people left on Manus and Nauru in New Zealand and Australia because that would be a “green light” to smugglers. As long as boat turn backs are in place, this argument is fallacious. While I agree that Rudd’s uncompromising ultimatum would have discouraged refugees, your presentation leaves out the inevitable impact of the parade of violent boat interceptions and scenes of cruel, ongoing imprisonment which the Coalition used to give emphasis to their determination to ‘Stop the boats! and ‘Never let boat people enter Australia’. Why are you so confident that the bastardry of Abbott and Mo played no part in this? The media may have their own excuses for sloppy reporting on who takes “credit” for stopping the boats. Obviously, it was the pressure by Abbott on Rudd which resulted in the extreme measures of July 2013 (putting aside Rudd’s belated claim that it was only intended to be a 12 month circuit breaker.) But what surprises me is that these errors of data analysis are repeated by academics specialising in refugee issues, who ascribe the big reduction in 2013 to boat turnbacks. Two recent examples are as follows. From The Conversation on March 5, ““The Coalition governments in 2001 and 2013 demonstrated that if this [offshore detention and processing for the future and the possibility of boat turn-backs – KB] proves to be wrong, introducing a hard-line policy can stop the boats very quickly.” https://theconversation.com/how-the-next-australian-government-can-balance-security-and-compassion-for-asylum-seekers-110713? I respectfully ask if the authors can clarify their views on this. If it becomes conventional wisdom that boat turnbacks were the decisive policy which stopped the boats, then public opinion will make it likely that we are stuck for a long time with an inhumane policy which contradicts our obligations under the Refugee Convention. Data from the Menadue graph above shows that the boat arrivals decreased dramatically from 35-48 over the months March-July 2013 to 25 in August, 15 in Sept, 5 in October, 5 in November, 7 in December. There is no room for ambiguity here: the task was overwhelmingly completed before the first turnbacks started on 19 December. For those interested in policy rather than partisanship, more important than who stopped the boats is how it was done. We don’t know what would have happened if turnbacks had not started in Dec 2013, but we do know that the boats were largely stopped by then. The available evidence after turnbacks started is that their effectiveness is minor, at best. The assumption of many voters that the Libs “of course” run the economy better than Labor is not much smarter than being a donkey voter. Are influential commentators aware of the consequences if the population believes that turnbacks stopped the boats? Future policy towards refugees will be harsh, rigid and unimaginative. It’s hard to imagine the entire press corps is so utterly ignorant. One can only be led to the conclusion that supposedly ‘reputable’ and ‘serious’ journalists are aware of these facts and choose to ignore them. In so doing they are consciously making themselves part of the LNP propaganda suite. Abbott, Turnbull and Morrison (along with their addled entourage of sickos, psychos, bozos and thieves) are contemptible liars who are undoubtedly guilty of crimes against humanity – as well as more vulgar offenses such as fraud and corruption in public office. This is a given. However, they would not have been able to get away with a fraction of these outrageous crimes without the active connivance of our mass media proprietors and their journalist hirelings. It is no wonder the contempt and disgust Australians feel and express towards our political class is only matched by the contempt and disgust they feel for their media enablers. It is hard to imagine how any person can distort the facts the way they do.